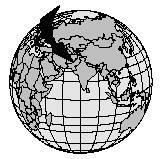 Pakistan lies northwest of India and west of China. The country's name comes from the Urdu language (Pakistan's official language), meaning "Land of the Pure." It is approximately the size of Texas and its southern coast borders the Arabian Sea. The Hindu Kush and Himalayan mountain ranges of northern Pakistan have some of the most rugged land found anywhere in the world. Nearly all of the land in these mountains lies above 7,800 feet. The Indus plains are in the central region of the country. The climate there is hot and dry. The region usually receives only about eight inches of rain a year and temperatures may hover around 104°F for months at a time. Despite these conditions, the Indus plains support the largest part of Pakistan's population. Urdu is Pakistan's official language, although only 10 percent of Pakistanis speak it. Sixty percent of the population speak Punjabi. Other languages include Sindhi (13 percent); Pushto or Pashtu, spoken by the Pathans (8 percent); and Kashmiri, 2 percent. With this diversity, and because of the role of language in cultural identity, Urdu has been adopted as Pakistan's national language. The spreading of the Islam religion, starting in the A.D. 700s, forms the basis of Pakistani cuisine. Because Muslims (those who practice the Islam religion) are forbidden to eat pork or consume alcohol, they concentrated on other areas of food such as beef, chicken, fish, and vegetables. and chicken tandoori are still enjoyed in the twenty-first century. Chicken tandoori is chicken that is cooked at a low temperature in special large clay ovens called tandoors. Remove the crusts from the bread with a knife. Cut the bread into four triangular pieces. Heat the oil in a frying pan (over medium heat) and fry the bread pieces one at a time on both sides until golden brown. In a saucepan, add the milk and sugar and bring to a boil, making a slightly thick sauce. Add the saffron to the sauce (optional). Reduce heat to low. Soak the bread slices in the milk sauce and garnish with the raisins or prunes (dried plums). Serve immediately. 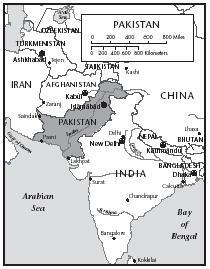 Pakistan was part of India until 1947. Although Pakistani cuisine has obvious Indian roots (found in its heavy use of spices, for example), its foods reflect Irani, Afghani, Persian, and Western influences to give it its own distinct character. These cultures brought different uses of herbs, flavorings, and sauces to Pakistan, transferring ordinary staple foods into unique dishes. Pakistan is divided into four provinces, each with different cultures and regional specialties. For example, machli (fish) and other seafood are delicacies in the coastal Sind province. In Baluchistan, (the largest province) located in western Pakistan, cooks use the sajji method of barbecuing whole lambs in a deep pit. The people living in Punjab (eastern Pakistan) are known for their roti (bread) and elaborate cooking preparations. The Pathens, who occupy the Northwest Frontier province, eat a lot of lamb. Their cooking, however, is considered more bland than the other regions. Oven-baked bread eaten with cubes of meat, called nan-kebab , is a favorite Pathen dish. As a whole, milk, lentils, seasonal sabzi (vegetables), and flour and wheat products are the most abundant foods, forming the basis of Pakistani cuisine. Chapatis is a flat bread made from wheat and is a staple at most meals. It is used to scoop up food in place of eating utensils. Vegetables such as alu (potatoes), gobhi (cabbage), bhindi (okra), channa (chickpeas), and matar (peas) are eaten according to the season. Dhal (or dal ) is a stew made with lentils, one of the most commonly eaten vegetables. Heat the oil over medium heat in a large frying pan or saucepan. Sauté the onion, garlic, and spices. Reduce heat to low, cover, and simmer until lentils are tender, about 45 minutes. 5. Remove the cover and simmer over low heat, stirring frequently, about 20 more minutes (until lentils are mushy and thick). Dhal is made from lentils. 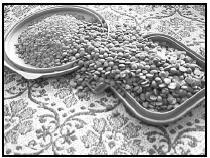 There are several varieties of lentils—red, brown, and green. All are used by South Asian (Pakistani and Indian) cooks. Pakistan offers many fresh fruits that are most plentiful in the summer and autumn months. Mangoes, papayas, bananas, watermelon, apricots, and apples are some examples. Chiku have the taste of a date and the texture of a kiwi fruit. Many Pakistanis eat their fruit (especially watermelon) with a light dusting of salt to offset the sweetness or tartness. While these dietary staples may seem bland, Pakistani cuisine is rich with sauces and condiments to spice up their dishes. A variety of spices (an Indian influence), such as chili powder, curry, ginger, garlic, coriander, paprika, and cinnamon, are at the heart of Pakistani cuisine. A wide range of chutneys (a relish usually made of fruits, spices, and herbs), pickles, and preserves that accompany meats and vegetables give Pakistani cuisine its distinct flavor. In a saucepan, add the water, salt, peppers, and chili powder to dried plums. Bring to a boil and cook until plums are tender, about 5 minutes. Reduce heat to medium and add sugar. Stir, and cook until the sugar melts and the mixture thickens, about 2 minutes. Add the vinegar and bring the mixture to a boil, about 2 minutes. Serve warm or at room temperature as a condiment with roti (bread), meat, or vegetables. Those who can afford it eat meats such as sheep, poultry, and sometimes gayka gosht (beef). There are a number of ways meat is prepared in Pakistan. Karai is a method where the meat is cooked with vegetables and served in its own pan. Jalfrezi is meat stir-fried with tomatoes, egg, and chilies. Tikka and bhoti kebab both refer to meat grilled on a spit (a slender rod or skewer) over an open fire. In a saucepan, boil the chicken in the water for 5 minutes. Remove the chicken and set aside. In a frying pan, heat oil over medium heat and add the tomatoes. Stir and cook the tomatoes until they form a thick paste. Add the ginger, salt, allspice, black pepper and chicken. Cook on low heat until the chicken is tender. Add the green chilies and cook for 2 minutes. 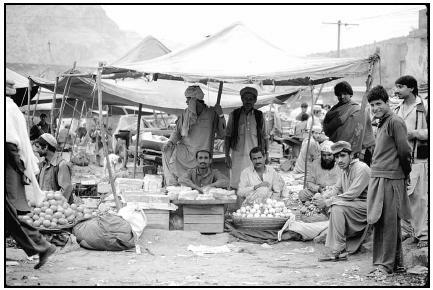 Fruit and vegetable vendors in Pakistan. this is considered economic, not religious). Seafood and machli (fish) are commonly eaten in Karachi, located on the coast of the Arabian Sea. There are a number of foods to cool off the spicy flavors of a Pakistani meal. Dãi (yogurt) can be eaten plain or used in lassi . Lassi is a drink made with yogurt, ice, and sugar for breakfast, or salt for lunch or dinner. Raita is a yogurt curd with cumin and vegetables. Baked yams and sita (boiled or roasted corn on the cob) may also accompany a spicy dish. This popular drink can be enjoyed sweet or salty. Pakistanis usually drink lassi sweet for breakfast, or salty for lunch or dinner. Pakistanis may enjoy such desserts as kheer (rice puding) or kulfi (pistachio ice cream). Some sweet shops may sell jalebi, which are deep-fried orange "pretzels" made with flour, yogurt, and sugar, and barfi, made from dried milk solids. Offering sweets to one another to celebrate happy events is a popular Pakistani tradition. Combine the rice and milk in a large saucepan and bring to a boil. Reduce heat to low and add the sugar and nuts. Stir. Sprinkle with raisins. Serve hot or cold. The majority of Pakistanis are Muslims, about 97 percent. The other 3 percent include Hindus, Christians, Buddhists, and Baha'is. Within the Muslim community, the majority are Sunnis, and about 25 percent are Shi'ah. The difference between these two Muslim groups generally lies in a dispute of authority, not beliefs. The two major religious festivals celebrated by the Muslim Pakistanis are Id al-Fitr (also spelled Eid al-Fitr), which celebrates the end of Ramadan, and Bakr-Id, the feast of sacrifice. Ramadan is the Muslim month of fasting from sunrise to sunset. This means that no food or drinks, including water, may be consumed during that time. Most restaurants and food shops are closed during daylight hours. Breakfast must be finished before the sun rises, and the evening meal is eaten after the sun goes down. Children under the age of 12 are encouraged, but generally not expected, to fast. Ground turmeric, which gives dishes a deep yellow color, is made by grinding the dried turmeric root. 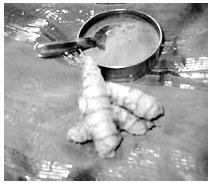 The turmeric plant is a member of the ginger family. and seeds, along with dates and bananas, are commonly eaten because they are considered slow to digest. This helps to ease hunger during the fast. At sunset, the day's fast is broken with iftar , a meal that traditionally starts with eating a date. After that, water, fruit juice, or lassi, and snacks such as samosas (meat or vegetable-filled pastries) are eaten, followed by dinner. Dinner may include tandoori chicken or lamb. If a family can afford it, dinner is shared with those less fortunate. Id al-Fitr, or the "Feast of Fast Breaking," is celebrated after the month of Ramadan ends. Family and friends visit and eat festive meals throughout the day. Families use their best dishes, and bowls of fruit are set out on the table. Meats such as beef, lamb, and fish (in coastal areas) are eaten along with rice, chapatis , and desserts. Bakr-Id is an occasion to give and sacrifice. A bakri (goat), sheep, camel, or any other four-legged animal is slaughtered as a sacrificial offering, and the meat is given out to the poor and needy. Muslims who can afford two meals a day are expected to sacrifice an animal. Nihari derives its name from the Urdu word nihar , which means "morning." A nihari breakfast in Pakistan can be very filling. Nehari (stewed beef), and mango are common breakfast items. Sometimes a dish made of meat cooked with chilies and other spices is cooked overnight to be consumed for breakfast the next morning, when it is eaten with naan , a type of bread, or parata , which is a flat cake fried in oil. Women prepare breakfast and all other meals for their family. Pakistani lunch and dinner dishes are similar. Roti (bread), chawal (rice), sabzi (vegetables), and gosht (meat) are the main elements of a meal. Chapatis or naan accompanies every meal. Rice is usually boiled or fried. Some rice dishes include kabuli pulau , made with raisins, and biryani, rice cooked in a yogurt and meat sauce. For the main dish, qorma (meat curry in gravy), qofta (lamb meatballs), or nargasi qofta (minced beef and egg) might be served. Water may be offered at the beginning or after a meal to quench thirst, but rarely while eating. Street vendors offer a variety of drinks and snacks. Chai , or tea, is a very popular drink. It is usually boiled with milk, nutmeg, and sugar. Lassi (a yogurt drink) and sugarcane juice are popular during the summer months. Another refreshing summer drink is nimbu paani , or "fresh lime." It is made of crushed ice, salt, sugar, soda water, and lime juice. Samosas are deep-fried pastries filled with potatoes, chickpeas, or other vegetables and are a popular snack. Other snacks are tikka (spicy barbequed meat) and pakoras (deep-fried vegetables). The use of child labor in Pakistan is widespread. Children not only work on farms, but in low-paying carpet weaving centers. In the mid 1990s, between 500,000 to 1 million Pakistani children aged 4 to 14 worked as full-time carpet weavers. UNICEF believed that they made up almost 90 percent of the carpet makers' work force. Little has been done to enforce child labor laws. In 1999, the United Nations got involved by setting up 300 schools in eastern Pakistan to encourage education for children in schools, not trade. Because of overpopulation only about 56 percent of Pakistanis have proper sanitation and access to safe drinking water. About 19 percent of the population of Pakistan are classified as undernourished by the World Bank. This means they do not receive adequate nutrition in their diet. Of children under the age of five, about 40 percent are underweight, and over 50 percent are stunted (short for their age). The Pakistani government has established several programs to improve these conditions, including the Child Survival/Primary Health Care program, to reduce malnutrition and deaths due to diseases. Amin, Mohamed. We Live In Pakistan. New York: Bookwright Press, 1985. Pakistan . Melbourne, Australia: Lonely Planet Publications, 1998. Spectrum Guide to Pakistan. Brooklyn, NY: Interlink Books, 1998. Weston, Mark. The Land and People of Pakistan. Armonk, NY: HarperCollins, 1992. Asia Recipes. [Online] Available http://asiarecipe.com/pakinfo.html (accessed April 16, 2001). Contact Pakistan. [Online] Available http://www.contactpakistan.com/pakfood/ (accessed April 16, 2001). Javed.com. [Online] Available http://www.javed.com.pk/Meals.html (accessed April 16, 2001). Mississippi State University. [Online] Available http://www.msstate.edu/org/psa/frontpage/articles/cuisine.html (accessed April 16, 2001). This information is very useful. Thanx for posting here. It is interesting and informative. But some editing is needed. Biryani (Rice with meat and yogurt) is a very common dish consumed almost daily in Pakistan. It is considered as an essential dish at the feasts of Eid al-Fitr and Bakr Id. At the time of wedding, biryani is a must. You have mentioned the use of biryani in a different way in this article. But I appreciate your efforts. This article is very nice, informative and interesting. Thanks.